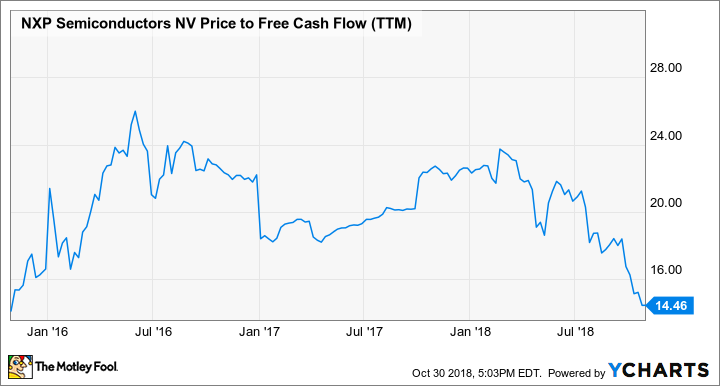 Is NXP Semiconductors N.V. a Buy? The Dutch microchip maker's stock crashed when Qualcomm withdrew a $44 billion buyout offer after a two-year courtship. That didn't take anything away from NXP's rock-solid business, so the buying window is wide open until further notice. Microchip maker NXP Semiconductors (NASDAQ:NXPI) is having an interesting year in 2018. A planned merger with larger rival Qualcomm (NASDAQ:QCOM) fell apart after two years of deal-wrangling and appeasing regulators around the world. Failed buyouts usually lead to plunging share prices, and NXP's case was no different. The stock is down 40% in 2018. Should NXP investors run for the hills, or is the stock about to bounce from a rock-bottom price level? I think NXP is a solid buy today. Here's why. Losing the Qualcomm deal doesn't change NXP's fundamental business model. Executing it, on the other hand, would have been a game-changer. So what we have here is the world's largest supplier of automotive computing chips, and the company also holds significant market share in several other key markets. From industrial microcontrollers and secure identification systems to power-sipping networking modules and mobile USB connectors, you'll find NXP chips inside many of the technology-packed products you rely on every day. NXP's management sees an opportunity to grow automotive sales by roughly 9% a year for the foreseeable future, comfortably ahead of the broader car-chip market which should expand by approximately 6%-7% annually. The growth opportunity in industrial sensors and control systems is even larger, clocking in at nearly 10% a year according to CEO Rick Clemmer. This stock may look scary if you see Qualcomm's failed bid as a bad omen. But that was hardly Qualcomm's choice. The prospective buyer simply had to give up the hunt when Chinese regulators dragged the buyout process out for far too long. If given a choice, Qualcomm would have been happy to spend $44 billion to expand its automotive and industrial market muscle. Yet NXP's stock is valued at a mere $23 billion today, or a $22 billion enterprise value if you want an apples-to-apples comparison to Qualcomm's proposed deal. The stock could nearly double in value before peeking above the proposed buyout's total price tag. Given the company's healthy business prospects, I see no reason to believe the stock will stay depressed for very long. It's hard to pinpoint where the market's mourning period over the dead deal will end, but end it will. And that's why NXP Semiconductors is a great buy right now. We're looking at a high-quality business whose stock is on fire sale for flimsy and downright emotional reasons.